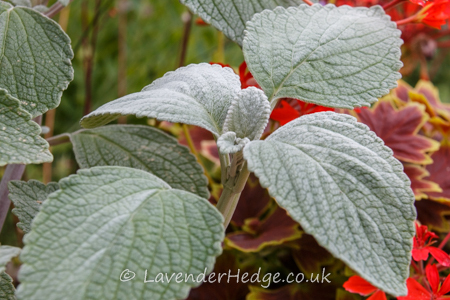 The thick silver-grey velvety leaves of Plectranthus argentatus make it a perfect foil when planted with dark leafed plants or strong contrasting flowers. Silver-grey textured foliage contrasts with many other plants and flowers. 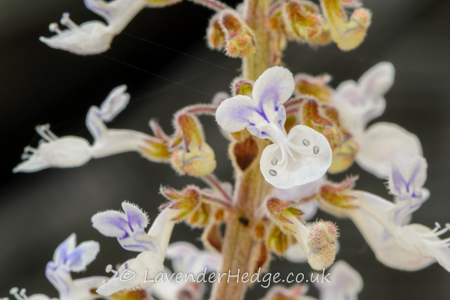 Plectranthus argentatus ‘Silver Shield’ is a native of Australia and therefore, is not hardy in this country, where it is best grown as an annual bedding plant or in a large container. It does not require full sun and is drought tolerant. The flower spikes produced in early autumn are fascinating, growing up to 20 cms long, and covered in a multitude of tiny flowers, each one just a centimetre high and resembling a miniature orchid. Some people prefer to pinch out the flower spikes when grown for foliage alone, but I rather like them. The young foliage has the most attractive colour, so it is best to raise new plants by taking cuttings. Overwinter cuttings in a greenhouse or keep indoors as a houseplant and take cuttings next spring. 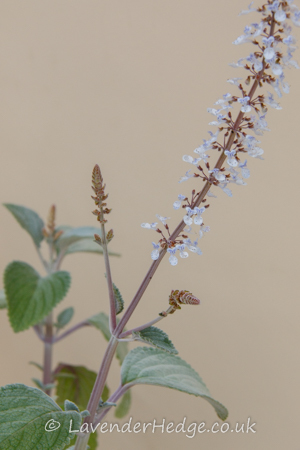 Plectranthus argentatus ‘Silver Shield’ grows approximately 60 cms high and wide. For further plant and flower inspiration, please check out my plant blog here. Oh dear Anne, better luck next time!